Much Lower Sale Prices Now! An eagle-eyed customer pointed out to us this weekend that our 70-case MH listing was not priced properly. He found that our MSRP list price was overstated in the listing (compared to what he found on the Mountain House site) and that thus, our 46% discounted price was not as low as we had intended. In fact, we then discovered that our new employee had also mistakenly made the same process error on all our Mountain House multiple-case listings for this sale. 1. We have corrected all the multiple case listings (the single full case case listings were not in error). 2. We have refunded all customers whose prior purchases during this month's big MH sale were affected by these pricing errors (averaging over $100 per customer). 3. We are happy to say today that our multiple case listings--from 6-case packages all the way up to 70-case packages are now SIGNIFICANTLY LOWER in price than they were previously. We sincerely apologize for that pricing process mistake and we hope you will have another look at the now properly discounted listings. As a way of extending our apologies, we have increased the discounts (for club members only) on our35-case MH package and on our 6-case MH package. 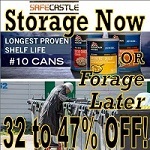 Fact is, the 35-case member discount is now 47%! ... even greater than the previously advertised maximum MH sale discount of 46% (on the 70-case package)!